Into Cambodia – Our first impressions of Phnom Penh. The sights and sounds of the Kandal Market in Phnom Penh, Cambodia. If there was one thing that we were most excited about on this journey to Southeast Asia – it was the Cambodian food. It was time for Pete to go back to school. This time it was to learn to teach English in Cambodia. A little bit of silliness goes a long way. While getting his TESOL certification in Cambodia, Pete applies it to teaching. On the way from Phnom Penh to Siem Reap, Pete made a stop at Spiderville in Cambodia to sample the local delicacy of tarantulas. 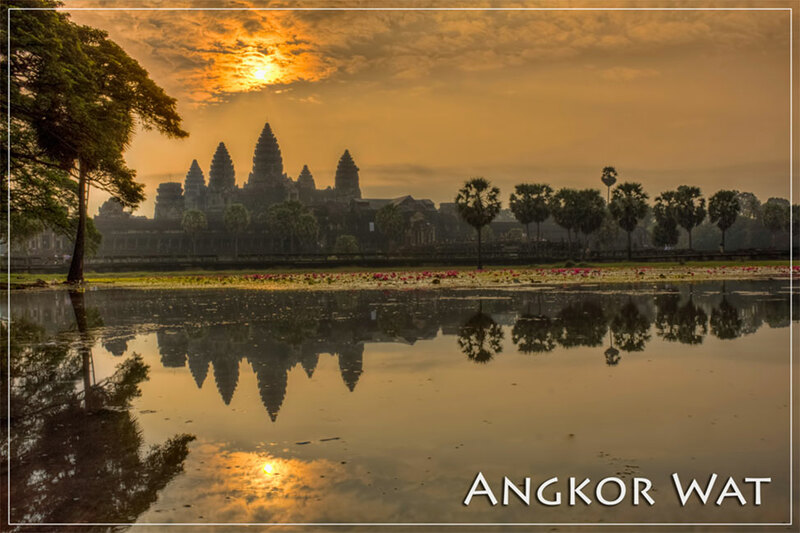 How our patience paid off to see the sunrise at Angkor Wat. Photos, photos and more photos about out visit to the Temples of Angkor near Siem Reap, Cambodia. We only had a short time to explore Sihanoukville in Cambodia, but we got to see three different sides of it. We were witness to a tragic protest in Cambodia. Their plight is one common to this part of the world – one of being overworked in deplorable and unsafe factories. Cambodian Genocide: it’s not an easy day to visit both the S21 and the Killing Fields. But it’s an important one. Exploring Phnom Penh can be an exhausting and daunting venture. But there are perfect spots throughout to steal away from the chaos, like The Royal Palace. A few of our best Cambodia photos turned into postcards.